I am so happy to share with you my personal with Dumbarton Oaks and Gardens (DOAKS). Washington DC is a small town and I have learned that in the museum business industry people could be in one museum and next thing you know they may be working in another museum. I met Patti the now museum buyer at DOAKS museum shop at the Textile Museum about 6 years ago. She worked at the gift shop and every time I would go or have a jewelry trunk show there we would see each other, chat and help each other whenever needed:) I am so proud of her and her ethics to work with the artists. She has always been very helpful and respectful. I saw Patti this year at the Embassy of Peru during passport DC 2013 and she told me she was now the buyer at Dumbarton Oaks; She was thinking to reach out to me cause she was looking for jewelry for her shop. And she thought my jewelry would be a good fit. So we agreed to sit down and showcase her my latest jewelry designs sometime in June. I came to this beautiful museum with my good friend Cecilia. It was a rainy day though as we walked in; everything was quite and we were able to see the beautiful collections. For those of you who know me well, know that I will always try to find out if there is any Peruvian inspired collections, and they DO. For those of you who are looking something different to do while visiting Washington DC., DOAKS has a lot to offer. The Robert Woods Bliss Collection of Pre-Columbian Art comprises objects from the ancient cultures of Mesoamerica, the Intermediate Area, and the Andes. 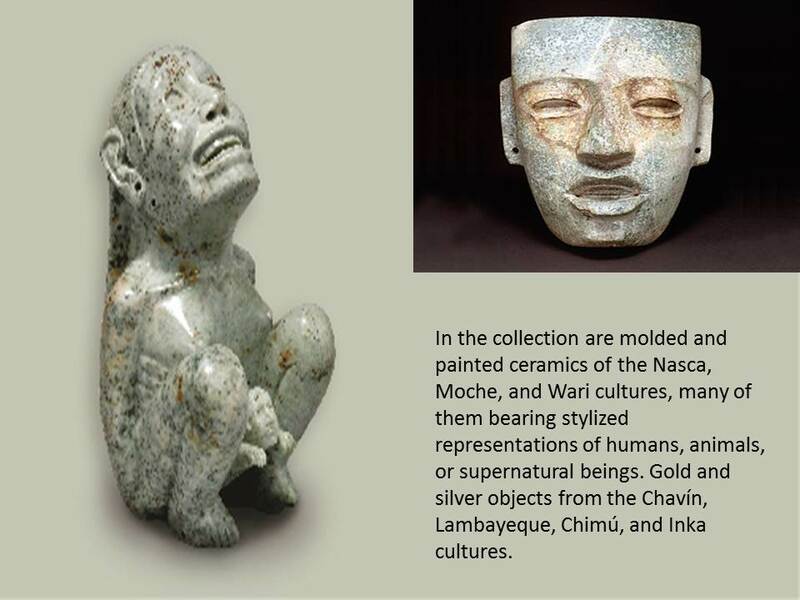 Also in the collection are molded and painted ceramics of the Nasca, Moche, and Wari cultures, many of them bearing stylized representations of humans, animals, or supernatural beings. Gold and silver objects from the Chavín, Lambayeque, Chimú, and Inka cultures offer evidence of the expertise achieved by Andean metalsmith, while over forty textiles and works in feathers testify to the importance of fiber arts in this region. A variety of personal objects in gold, shell, and semi-precious stone were part of the panoply of the elite, and attest to differences in taste, technology, and ideology across the Pre-Columbian world. In 2013, Dumbarton Oaks celebrates the fiftieth anniversary of the Robert Woods Bliss Collection of Pre-Columbian Art with a year-long program of exhibitions and events.. The Museum Shop offers an extensive and eclectic selection of gift items, textiles, jewelry, and books inspired by the Dumbarton Oaks Gardens and Museum Collections.